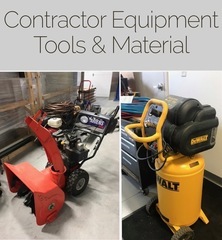 M21769 A contractor is downsizing and selling construction tools, materials, and electrical supplies! AUCTION CLOSING DATE: Monday, June 11th 11:07am. Bidding closes on the first item at 11:07 am, then closes at the rate discussed in these Terms and Conditions of Sale. If you do not follow the procedures discussed in this paragraph, the Auctioneer will be unable to consider identifying you as exempt from taxation, and you will have to apply directly to the applicable state for a refund. Please also note that, depending on the state whose sales tax applies, submission of the Auctioneer’s tax exempt form may not be sufficient to entitle you to tax-exempt status. Please review the form and its contents carefully, and contact the Auctioneer with any questions you may have.